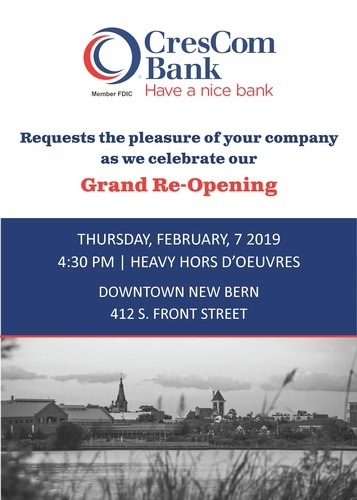 Join as we celebrate the Re-Grand Opening for CresCom Bank. CresCom Bank, the second largest community bank in the Carolinas, is dedicated to providing exceptional customer service and quality products to the communities it calls home, and prides itself on its strong knowledge of local business and economic trends. Currently, CresCom Bank has 61 branch locations throughout North and South Carolina, and as of September 30, 2018 has approximately $3.7 billion in total assets. Under the holding company of Carolina Financial Corporation (NASDAQ: CARO), CresCom Bank is one of the 29 small-cap banks in the nation to be recognized as a 2017 Sandler O’Neil Sm-ALL Stars. CARO was also added to the Nasdaq Community Index (ABAQ) by the American Banker’s Association. CresCom Bank owns Crescent Mortgage Company, which originates loans in 47 states partnering with community banks, credit unions and mortgage brokers. Stay current on bank news and happening on the CresCom Facebook and Twitter pages. CresCom Bank and Swiss Bear, Inc. will also make a special announcement to commemorate the incredible New Bern community whom banded together through the devastation of Hurricane Florence with a commissioned “New Bern Strong” bear statue. CresCom bank branch located at 412 S. Front Street is open regular business hours.